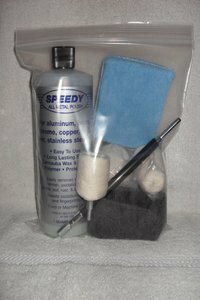 THIS THOROUGH BIG RIG KIT ADDRESSES THE PROBLEM OF LIGHT TO MODERATE OXIDATION ON ALUMINUM WHEELS. 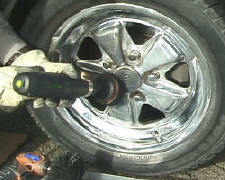 IT IS NOT INTENDED FOR VERY HEAVY OXIDATION, OR ROUGH AND PITTED WHEELS DUE TO YEARS OF NEGLECT. THE COMPONENTS OF THIS KIT ARE AS FOLLOWS: THREE 3 1/2″ WOOL PADS (CUTTING), THREE 3 1/2″ YELLOW FOAM PADS AS AN ADDED CUTTING OPTION, ONE 4 OZ. JAR OF NUVITE F7 METAL POLISH (CUTTING), THREE 3 1/2″ WOOL & SYNTETIC YARN PADS (POLISHING & FINISHING), ONE 4 OZ. JAR NUVITE S GRADE METAL POLISH (FINISHING), ONE EXTENDER KIT (8″ EXTENDER AND A 3″ MUSHROOM BUFF) , TWO SMALL CYLINDER BUFFS FOR SLOTS, ONE EXTRA 3″ MUSHROOM BUFFS FOR AROUND LUG NUT AREA, ONE TAPER BUFF (TO BE USED OPTIONALLY WITH CLYLINDER BUFF), ONE BACKING PLATE WITH A 1/4″ SPINDLE (CAN BE USED ON 1/4″, 3/8″, AND 1/2″ DRILL), FOUR 16″ X 16″ MICROFIBER TOWELS FOR FINAL WIPE DOWN, AND WE HAVE ALSO JUST RECENTLY ADDED FOUR 0000 STEEL WOOL PADS TO ASSIST WITH HAND POLISHED AREAS. THIS KIT IS NOT INTENDED FOR CLEARCOATED WHEELS. BRIGHT WORK METAL POLISHES ARE USED IN THE AIRCRAFT INDUSTRY. USE THE POLISHES SPARINGLY AS A LITTLE GOES A LONG WAY. 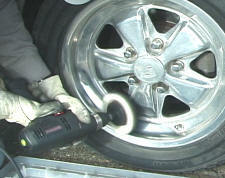 THE 8″ EXTENDER IN THIS KIT IF FOR THE HARD TO REACH AREAS. TO USE, SIMPLY UNSCREW THE SHAFT FROM THE GOBLETS AND THREAD THE EXTENDER ON TO THE BUFF.